Research finds they are referred to law enforcement and arrested more than any other group. 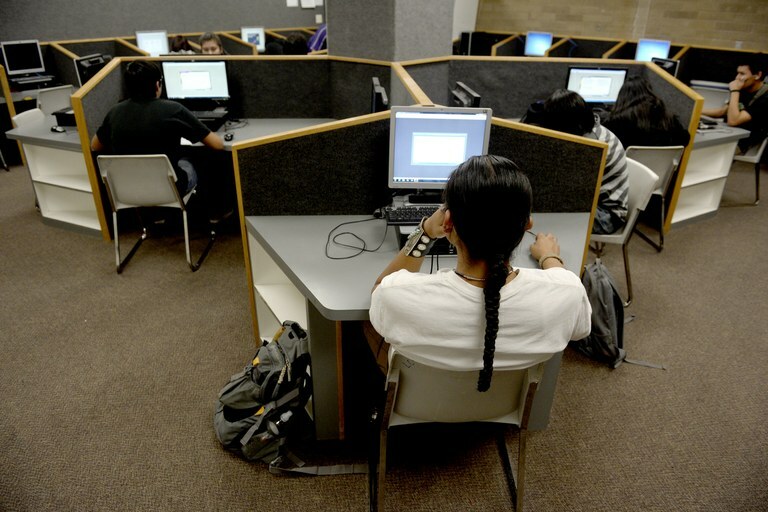 A Native American student works at a computer at Monument Valley High School, in Utah. Native American students are disproportionately arrested, thanks to Utah's zero tolerance policies. The U.S. education system has an especially tortured relationship with Native American students. Until just a few decades ago, many American Indian students left or were taken from their families to be educated in boarding schools, as part of the government’s forced assimilation policy. The schools had a reputation for strict and often abusive disciplinary policies that are still remembered vividly by those who attended. In recent years, states and the federal government have tried to do better, including incorporating tribal languages and culture into public schools and relinquishing more control to tribes. Still, changes to school discipline have been slow to follow. Nationwide, Native American students receive the second highest rate of out-of-school suspension of any ethnic group and are disproportionately expelled. According to Walsh’s report, the harshest discipline for Utah’s American Indian students today takes place in rural areas and in the schools closest to the state’s eight reservations. For example, in the San Juan School District, where the two boys were caught stealing soda, more than 10 percent of American Indian students have been referred to law enforcement, compared with less than 2 percent of white students. One high school in the district referred almost a third of its American Indian students. Other Western states face similar disparities and are grappling with how to respond. In 2007, a lawsuit from the American Civil Liberties Union forced one South Dakota school district to reform its policies to protect Native American students. In Colorado, American Indian students are nearly three times more likely to be referred to law enforcement than their white peers, according to a report released last summer. In Montana, Native American students are almost five times as likely to be expelled as white students. As for Utah, Walsh has reported her findings to the ACLU and met with state officials and representatives to discuss the issue. So far, she said, she hasn’t been able to get support for a legislative task force or policy changes. Kate Schimel is an editorial intern at High Country News.